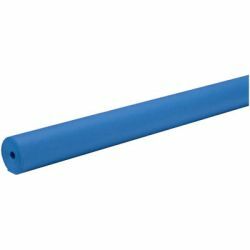 Catalog Home > Art Kraft® Paper Roll, Royal Blue, 48" x 200'"
Art Kraft® Paper Roll, Royal Blue, 48" x 200'"
Duo-finish 50 lb. basis weight Art Kraft® paper. Non-bleed smooth side for felt pen and fine line drawing; tooth surface for wet chalk, tempera or acrylics. 48" x 200'. Additional shipping charges apply.